In the middle of the week, I like to do something simple. Who doesn’t? And what’s simpler than going onto Pinterest and finding yourself a recipe? Not much, in my opinion. These recipes cater to college students and moms who, frankly, don’t have that much time on their hands, but yet they want to make a delicious and healthy meal for their family. Kudos to them. I stumbled upon this recipe several months ago and I love it. It’s Lasagna Rolls. What’s not to love about it? You get lasagna in half the time. Not to mention it also bakes in half the time. Cha-ching, people. Cha-ching. THE METHOD. Surprisingly, there are a couple of techniques to learn while making this dish as strange as that sounds. The two major components here are the sauce and the filling. T HE SAUCE. I make a basic tomato sauce. There are 6 ingredients ( Well, main ingredients. I don’t count oil, salt, and pepper as ingredients…those are requirements to almost any dish). That’s it. It’s a sauce that lets the ingredients shine, which is what I love about it. And since there are only six ingredients, they need to be some of the best ingredients that you’ve ever eaten. In a hot pot, add the olive oil and sauté the onion until translucent. Add your minced garlic and and red pepper flake. Cook this for a minute just to bring out the aromatics. Crush the whole tomatoes and add to the pot. Add whole thyme sprigs and bay leaf. Season to taste with salt and pepper. Leave it to cook over low heat for as long as possible. Tomato sauce is one of those things that the longer you let it cook, the better it will taste. Some folks add sugar to their tomato sauce to combat the acidity of the tomatoes, but I really like it the way it is. I like it to have that bite. Also, I always make my tomato sauce with canned tomatoes because they are picked when ripe, steamed, and then canned. You can’t get a better tomato for a sauce than that. That’s just my opinion, though. Now, I already had the sauce made from a previous Italian dish. So, I just pulled it out of the freezer and let it thaw out. To add a little something extra to this dish, I crisped up some pancetta and then poured the sauce over it to cook for a couple more hours. It gives it a unique saltiness and flavor. THE FILLING. The other main component is, of course, the filling. It starts out as a basic ricotta filling and then you can add whatever flavors you want to it. I bought some baby portobello mushrooms at the grocery store earlier in the week and I know that they will work really well in this lasagna. To prepare the mushrooms for the filling, chop them as fine as possible. I used a food processor for this because it makes life easier. 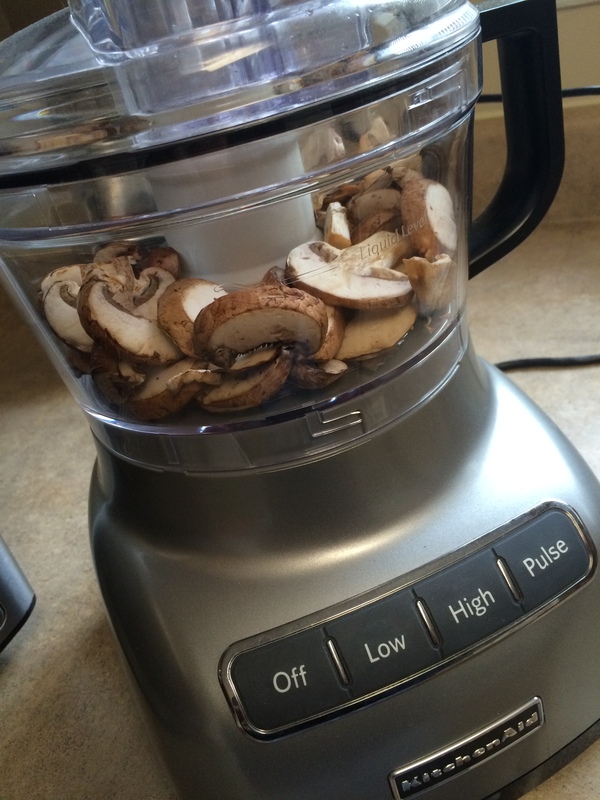 You’re basically making a mushroom paste here. Add the paste to a dry pan over medium heat and cook down until all the moisture has evaporated. Believe it or not, mushrooms hold a lot of moisture and it is necessary to cook it all out so that the filling doesn’t become soggy. It will take about 15 to 20 minutes. Put the cooked down paste into a medium-sized bowl and let it cool down. Once it is cool, add your ricotta, parmesan, and shredded mozzarella. Season to taste with salt and pepper. Stir until fully combined. This is where you need to make sure that your seasoning is on point. It actually should be a little over seasoned because once it is added to the pasta, the flavor will neutralize a bit. THE ASSEMBLY. Ah, the easy part. 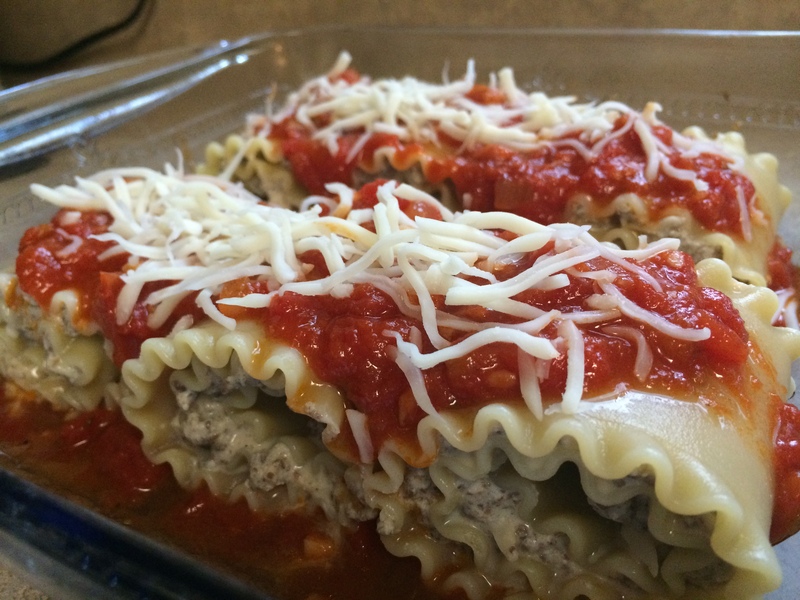 All you do is take par-cooked lasagna noodles and lay them out on a clean surface. Spread a thin layer of the filling all the way down the noodle. Roll it up and place in a lightly-greased baking dish. Cover with your sauce. Bake covered with aluminum foil for 20 minutes at 400 F.
ENJOY IT. Serve with bread and a green salad. 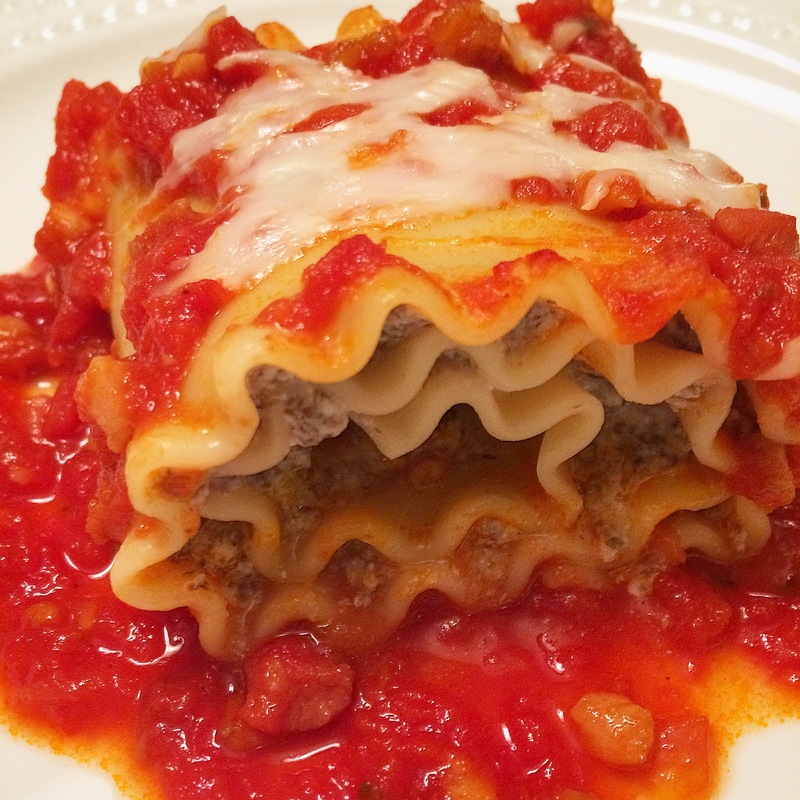 Relish in the fact that you made a delectable lasagna without all the hassle of the traditional lasagna. I personally think it’s a perfectly respectable replacement. 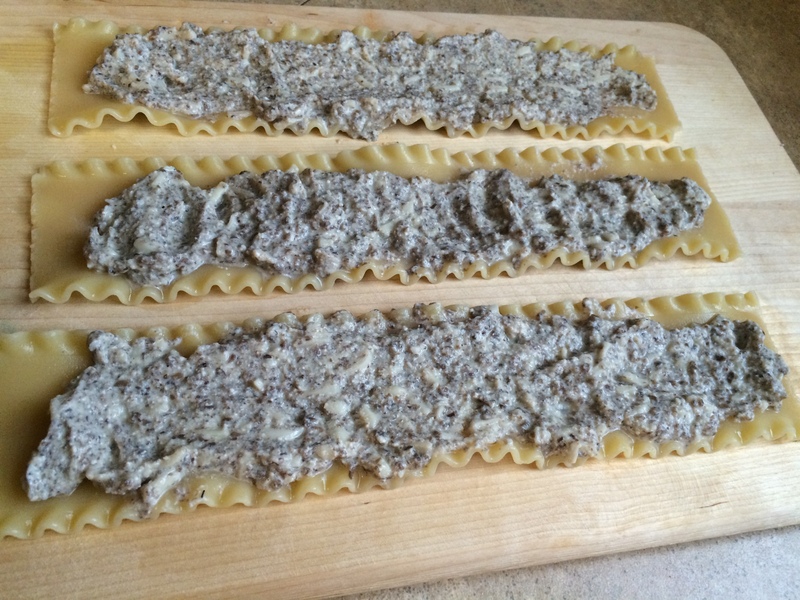 Simple doesn’t have to be bland and I think that this recipe shows that. It has big, powerful flavors. Perhaps even the Italians will be accepting?